Photography writer and historian Deborah Ireland gives us an insight into Victorian photographer John Thomson’s far-reaching influence on other famous Victorian writers such as Isabella Bird as well as on film and TV design today. John Thomson is one of the great photographers in the history of photography and his connection with The Royal Geographical Society spanned fifty-five years. When I was working in the Collection of The Royal Photographic Society in the 1990’s we received many enquiries regarding his work. We held copies of Illustrations of China and its People (1873 – 1874) illustrated with Collotypes, and Street Life in London 1876 -1877 illustrated with Woodburytypes. As the RPS Collection had every type of photographic process, sometimes researchers would ask to see Thomson’s work because of the quality of the Collotypes and Woodburytypes. Film & television researchers working on projects set in the nineteenth century would often ask to see Thomson’s photography for costume and stage set reference. Thomson’s photography is always beautifully considered and composed. 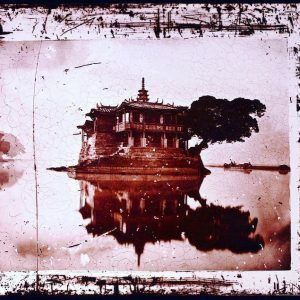 At the moment, I am researching Thomson negatives held at the Wellcome Institute but I would like to make a facsimile copy of Thomson’s album Foochow and the river Min, a copy of which is held by the Science Museum. Only 46 copies were made when it was published in 1873 and it contains the most beautiful images of China. In 1886, he became The Royal Geographical Society’s instructor of Photography giving lessons to intending travellers. An hour’s lesson costing 2s. 6d. One of his pupils was Isabella Bird (Mrs. Bishop). She was one of the best–selling travel writers of her day and met John Thomson when she was 61, for her first photography lesson. What is very clear is that once she started to learn, she loved everything about the process of photography. It became an “Intense pleasure”, “a complete craze”. To try out her new skill she went to China, following in Thomson’s footsteps, literarily. Often setting up her camera in almost the same place. She would spend three years travelling and when she returned published books on China illustrated with her own photographs. Deborah Ireland is a writer, curator and researcher on the History of Photography with particular interest in Travel Photography. Since 2012 she has worked on projects for The Royal Geographical Society, including curating Travel Photography of the Past exhibition in 2013. She wrote and researched Isabella Bird a photographic Journal of Travels through China 1894 – 1896 published by Ammonite Press for The Royal Geographical Society in 2015.